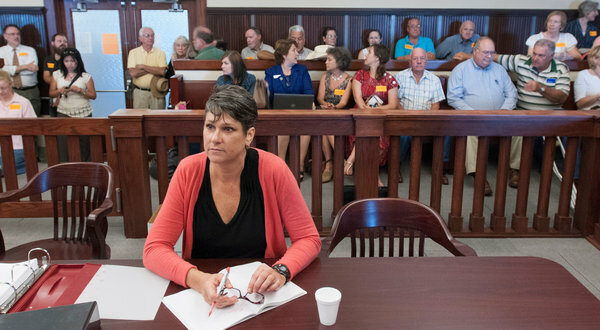 Julia Trigg Crawford, a farmer, plans to appeal a Lamar County judge’s ruling in favor of the oil company TransCanada. PARIS, Tex. — The Canadian energy company TransCanada can take over land owned by a Texas farmer to build its Keystone XL pipeline, a county judge ruled on Wednesday night. In a 15-word ruling sent from his iPhone, Judge Bill Harris of Lamar County Court at Law upheld TransCanada’s condemnation of a 50-foot strip of land across Julia Trigg Crawford’s pasture here. The pipeline is being built to carry oil to Texas refineries from Canada. The case has shed light on a loophole in Texas’s oil and gas regulation — one that critics say has given pipeline companies carte blanche to seize private land. Activists across the political spectrum have rallied behind Ms. Crawford’s cause, from conservative rural landowners and Tea Party organizations to environmental groups. At issue was whether TransCanada is a common carrier — a company with pipeline open to any oil company willing to pay published rates. In Texas, a common carrier has the power to condemn land with little oversight. The problem, Ms. Crawford’s supporters say, is that to earn the designation, an oil company need only claim the status itself on a one-page form submitted to the Texas Railroad Commission, which regulates pipelines. The court recommended a set of uniform standards for common carriers, and a body to enforce it. Ms. Hammond was new to the case, having represented Ms. Crawford for just 11 days. Previously, Ms. Crawford’s counsel had argued that TransCanada could not be a common carrier because it carried diluted bitumen, not crude oil, because the Keystone pipeline had not yet been granted a federal permit, and because the pipeline company had not negotiated in good faith, among other things. Packing the courtroom were around 50 supporters of Ms. Crawford. To some, the case showed why regulatory reform was needed. Debra Medina, a Republican former candidate for governor, said she drove seven hours to be at the hearing. I do agree with all of the ideas you’ve offered to your post. They’re really convincing and can certainly work.